Strikes loom at local grocery stores, and at communications giant Verizon, but is walking the picket line really a good idea during an economic downturn? 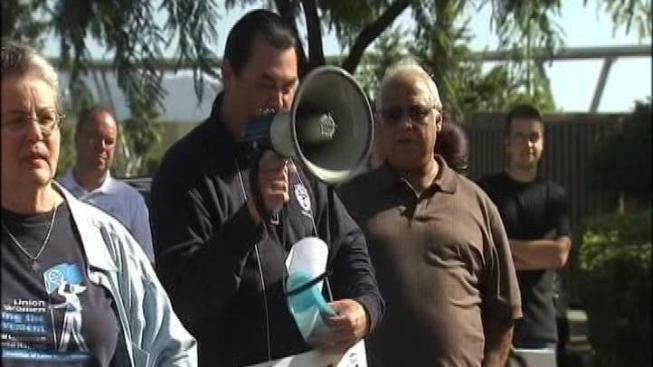 Picket lines may soon greet customers at grocery stores across Southern California. At the end of the week, more than 60,000 employees of Ralphs, Vons and Albertsons will vote on whether to strike, but some question whether striking in a tough economy is such a good idea. "I personally am grateful for my job, so to go on strike if you have some other kind of income go for it, but in this economy I'm not willing to take that chance," says Ryan Mayon, shopper. "Life is hard right now. There are no jobs and I wouldn't do that," says Margie Asseltyne, shopper. "I think they need to do what they need to do because if the problem isn't taken care of now then it will just continue to be that way," according to Justin Smith, shopper. At issue for grocery workers is the amount of money they'd have to contribute to their health care. Their union wants health benefits to be fully funded, an increasing rarity in an era of rising health care costs, but other union workers say it's about fighting to maintain a way of life. "This is about the middle class. It's not just about union, it's about the middle class coming together. We're trying to survive," according to David Goodwin, Verizon employee. Goodwin joined other communication workers on Monday in picketing the Verizon store in Burbank. Verizon employees are not on strike in Southern California, but they're showing their support for their colleagues who are on strike on the east coast. "This issues go from freezing pensions, freezing wages, freezing all of the collective bargaining that they've accomplished over the last 50 years," says Judy Rapue, of the Communication Workers of America. With the unemployment rate in California among the highest in the country, it may be tough for striking workers to find sympathy and support from the general public, but union officials say big corporations are using the weak economy as an excuse to cut employee benefits. "The economy's not horrible for Verizon," says Rapue. "They make billions of dollars in profits, and they have the resources to help the middle class, to put people back to work."